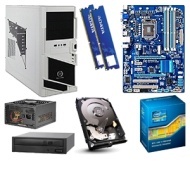 alaTest has collected and analyzed 277 reviews of GIGABYTE Ivy Bridge Unlocked Barebones Kit - GIGABYTE GA-Z77-DS3H Board, Intel Core i5-3570K CPU, ADATA 8GB DDR3 RAM Kit, Seagate 1TB HDD, 24x DVDRW,. The average rating for this product is 4.6/5, compared to an average rating of 4.2/5 for other Desktops for all reviews. We analyzed user and expert ratings, product age and more factors. Compared to other Desktops the GIGABYTE Ivy Bridge Unlocked Barebones Kit - GIGABYTE GA-Z77-DS3H Board, Intel Core i5-3570K CPU, ADATA 8GB DDR3 RAM Kit, Seagate 1TB HDD, 24x DVDRW, is awarded an overall alaScore™ of 84/100 = Very good quality.